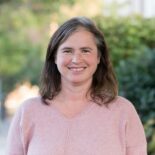 After graduating from NCNM (now NUNM) in 2010 with a Doctor of Naturopathic Medicine, Dr. Kate Patterson developed a primary care, private practice in Portland, Oregon. There, she enjoys working with patients who seek a holistic approach to optimizing health and holds a special interest in working with those living with difficult to treat, chronic conditions. In 2011, Dr. Patterson returned to NUNM in a teaching capacity. She is presently an associate professor, instructing students in the art of laboratory medicine. She balances these complementary careers while enjoying time with her family and creating delicious, healthful meals.